Land Conflict Watch define land conflict as any situation in which public opposes change in the current use or ownership of land by government agencies or private parties. These conflicts can also be over naturally occurring land resources like forest, underground water, fish stock etc. Ongoing conflicts that have been recorded in a written or audio-visual format at any place from the level of Gram Sabha (village council) upto the national level are included in this study. These records could be news reports, gram sabha resolutions, public hearing records, memorandums submitted to authorities, police records or court documents. Land conflicts between two private parties or between a private party and the government are excluded, unless the magnitude of the conflict is such that it affects a larger public interest. The land conflicts reported with an unknown starting year have been excluded when aggregating the values for the indicators available on the Land Book of the Land Portal, but complete and up-to-date records for each of the reported conflict can be accessed on the Land Conflict Watch platform. 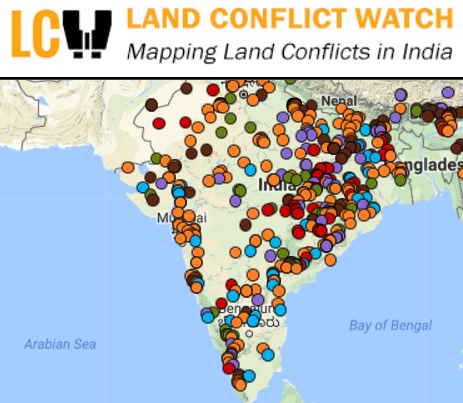 There is available online the methodology and caveats of the Land Conflict Watch project and an interim analysis of the data (as of November 2016). Please note that: the numbers partially represent the ground situation because data are still being collected; The number of people affected, land area, and investment figures are indicative and based on the best available estimates; In most cases, summaries of the conflicts are based on media reports.